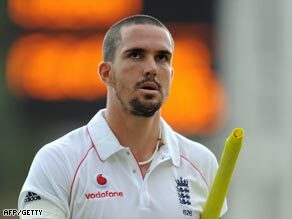 (CNN) -- Deposed England cricket captain Kevin Pietersen led from the front as the tourists battled to 236 for five wickets on the opening day of the first Test against West Indies in Jamaica. A dejected Pietersen departs after falling three short of his 16th Test century. England struggled all day on a slow Sabina Park pitch offering help to the bowlers, but in particular spin, and it was left to Pietersen to provide the mainstay of the innings. Pietersen came to the wicket after the departure of new captain Andrew Strauss for just seven and fellow opener Alastair Cook for four, leaving England 31 for two. He combined with Ian Bell in a third wicket stand worth 40 before the West Indies spinners took command. Captain Chris Gayle had Bell caught at slip by Devon Smith and left-armer Sulieman Benn trapped Paul Collingwood plumb leg before wicket for 16. The remainder of the afternoon session was a real struggle, with the tall two meter Benn a handful, but Pietersen and fit-again all rounder Andrew Flintoff taking them to the interval at 132 for four off 57 overs. In the final session Pietersen scored more freely and was closing on his 16th Test century when he perished to Benn. He had struck him for two fours and a six in the same over but attempting to clear the fence for his ton miscued and sent a steepling catch to wicketkeeper Denesh Ramdin. Pietersen's dismissal for 97 left England 180 for five wickets, but Flintoff and wicketkeeper Matt Prior saw them to stumps without further loss to leave honors even on the first day. South-African born Pietersen was sacked as England captain last month after a public falling out with coach Peter Moores, who departed on the same day, leaving Strauss to fill the vacuum. The Middlesex opener made a nervy start after winning the toss and electing to bat and it was no surprise when he edged Jerome Taylor to slip. Bell, who held on to his place in face of challenge from Owais Shah, briefly formed a good partnership with Cook until the opener holed out at mid-on off Daren Powell.